I also discovered that Bungie has shut down all their old Halo stuff, so I’ve removed my Bungie Card gadget from my site. Windows Sidebar is officially dead at this point, and Dashboard doesn’t seem long for this world, so I’m unlikely to do anything with these myself, but they’re all open for pull requests, so hopefully if somebody’s still interested in them they can be improved. My first widget was an ultra-simple Xbox Live Gamertag widget, which was basically a straight port from the Windows version. Aside from the preferences, which are now on the “back side” of the widget instead of a fly-out panel, not much is different. 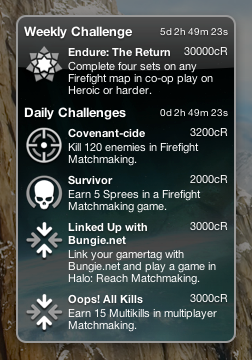 The second widget is a bit more complex - it shows the current challenges available in Halo: Reach. Every day (and week) there are new challenges players can meet in order to get credits to buy in-game armor. This widget helps keep that info a keypress away. Anyway, if you have a Mac, please head on over to my Dashboard Widgets page and give them a shot! 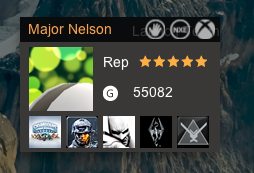 Update: Since Bungie has discontinued their Reach site, I’ve removed the Reach gadget.